TORONTO, Sept. 13, 2018 /CNW/ - Murchison Minerals Ltd. (MUR - TSXV) ("Murchison " or the "Company") is pleased to provide the results of the updated Mineral Resource estimate (the "September 4, 2018 Mineral Resource Estimate" or the "Estimate") for the Brabant-McKenzie Deposit (the "Deposit") located in north-central Saskatchewan. The September 4, 2018 Mineral Resource Estimate was performed by Finley Bakker Consulting, of Campbell River, BC. The new estimate includes the addition of 19 new diamond drill holes totaling 9,004 m which were completed between January and March 2018 by Murchison as well as a comprehensive re-interpretation of the geology of the Deposit using current and historical drilling data and reports. The September 4, 2018 Mineral Resource Estimate was calculated using Minesight/Hexagon 3D modeling software to define the mineralized limits of the Deposit. The results will now be used to further systematically define future exploration programs for the Deposit. The September 4, 2018 Mineral Resource Estimate for the Deposit is provided in Table 1. Murchison's CEO and President Kent Pearson stated: "We are excited with the results of the 2018 resource estimate update as we continue to meet our objectives and successfully build on last year's work on the Brabant-McKenzie Deposit. We believed this Deposit had room for further growth from the previous resource estimate and the increase in the Brabant-McKenzie resource estimate is significant as it demonstrates the potential for a robust deposit. Our geological modelling continues to outline and confirm the mineral continuity and the high-grade nature of the Deposit. Results from this program will be used to design next steps for exploration including additional drilling. We are focused on advancing the Deposit to a stage which is intended to allow us to begin applying economics to it in an effort to determine its viability for development. Our team is committed to advancing the Brabant-McKenzie Deposit based on sound exploration methods and prudent allocation of financial resources as we work to deliver value for our shareholders." The September 4, 2018 Mineral Resource Estimate has been prepared by independent qualified person ("QP") Finley Bakker, P.Geo., and has an effective date of September 4, 2018. The completed Technical Report, presented in standard form prescribed by Canadian National Instrument 43-101 Standards of Disclosure for Mineral Projects will be published on Murchison's web site and SEDAR www.sedar.com within 45 days of this news release. The September 4, 2018 Mineral Resource Estimate was classified into Indicated or Inferred categories in accordance with the CIM Definition Standards on Mineral Resources and Reserves (CIM Definition Standards) adopted by CIM Council on May 10, 2014. The focus of the 2018 diamond drill program was to test potential mineralization both laterally and down dip of the previously modeled resource as well as to upgrade inferred resources to the indicated resource category (Figure 1) Drilling was successful in both aspects and provided significant confidence in the continuity of the mineralized zone. The new resource calculation is based on a 19-diamond drill hole program, visual inspection and re-examination of previous drilled core and ongoing review of historical drill records. 2018 Mineral Resource Estimate tonnage has been rounded to reflect the accuracy of the estimate, and numbers may not add due to rounding. The results of the updated resource estimate and overall geological model will be used to assist in designing next steps for the exploration program on the Deposit's advancement including additional follow-up drill programs. There are no known legal, political, environmental or other risks that could materially affect the potential development of the mineral resources. The core was logged and split in a secured core logging facility. Individual samples were labelled, placed in plastic sample bags and sealed. Groups of samples were then placed in security sealed bags and shipped directly to the Saskatchewan Research Council Laboratories ("SRC") in Saskatoon, Saskatchewan for assay analysis. 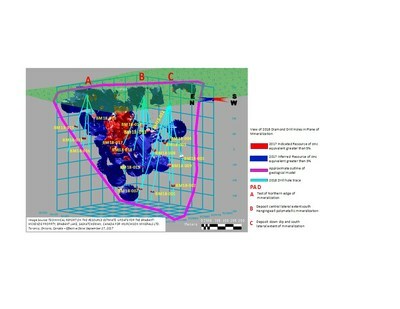 SRC used the ICP3 Base Metal Exploration Package for analysis. Check assays were undertaken by ALS Labs located in Vancouver B.C. Assay results for both methods were acceptable. SRC and ALS are independent of the Company. Both SRC and ALS are ISO17025 accredited. consultant to Murchison Minerals Ltd. and the Brabant-McKenzie project. Mr. Pearson is President and Chief Executive Officer of Murchison Minerals Ltd.
7,379 hectares which cover approximately 18 km of strike length over favourable geological horizons, multiple known mineralized showings and identified geophysical conductors. conditions, industry conditions, and dependence upon regulatory approvals. Readers are cautioned that the assumptions used in the preparation of such information, although considered reasonable at the time of preparation, may prove to be imprecise and, as such, undue reliance should not be placed on forward-looking information. The parties undertake no obligation to update forward-looking information except as otherwise may be required by applicable securities law.